Ronin is a new PS4 release and a little hard to define. Initially as the tutorial plays out you might think it’s a platformer with weird controls as you use the left stick to move and can angle your jump with the right stick, but encounter an enemy and things take an interesting turn. You play as an unnamed female assassin who is out for revenge against the five people who killed your father/master. You don’t know how or why they did what they did as the photo that you use to cross them off as they are killed shows them with you and your father, all friendly like. All you know is that they must pay. Each of the fifteen levels takes place in a similar environment, a near future cityscape and a building or two. 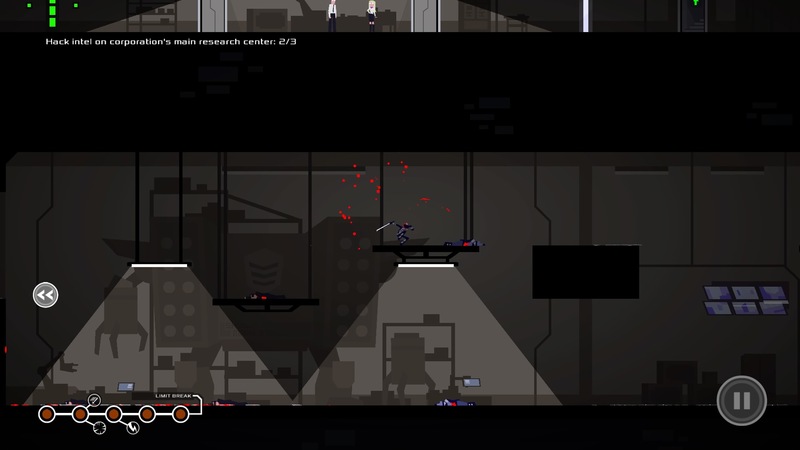 Each kill is separated into three levels, the first two involve reaching and hacking computers to acquire the location of the kill and the third requiring you to infiltrate their base and kill them. Hacking is as simple as pressing X on the computer terminal and you need to reach your bike at the end of every mission to escape. 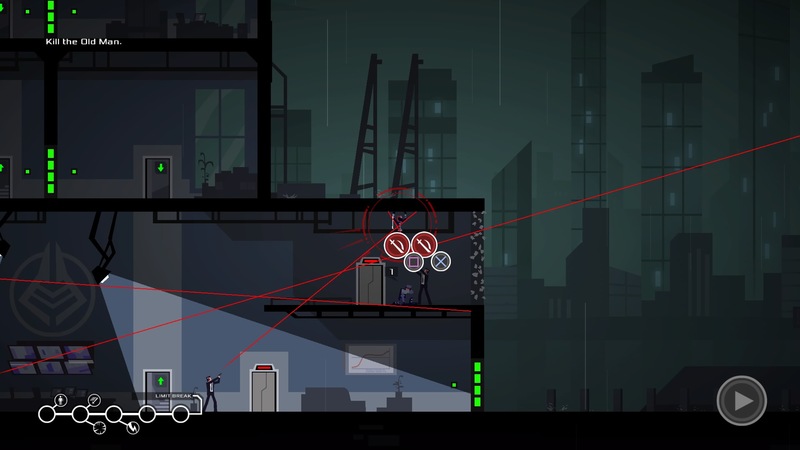 The game’s 2D visuals are striking in style and do a good job of conveying your character’s ninja like abilities whilst storming these high tech skyscrapers. The music I found a little forgetful though it does change suitably depending on whether you’re engaged in combat or not. There are three sub objectives to complete if you choose. Do not harm civilians is one and is relatively straight forward although if you are spotted by a civilian they will raise an alarm if they are left to do so. Never raise the alarm is another, which is arguably the most difficult. If anyone notices anything untoward they will start a count down from nine and if they reach zero an alarm will trigger. The third is to kill all enemies on a stage which is pretty self explanatory. Completing all the sub objectives in a level grants you a skill point to put into your skill tree which will offer you some new moves to dispatch enemies, although these must be powered up by scoring kills. Which leads me to the main element of the gameplay: the killing. Early on there’s a tool tip that says something along the lines of ‘This is not a stealth game, kill everyone’ and that is true. 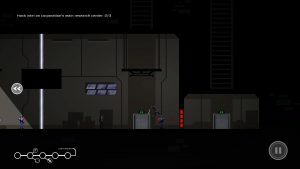 There is light and shadow in the game which allows you to get the drop on certain poorly placed enemies but sooner or later things are going to pop off and you’re going to need a decent grasp of the mechanics to survive. Once spotted direct control is taken away from you and you engage in a turn based system. The controls are the same except you make a move and then the enemy gets theirs with time stopping inbetween. You can no longer run as normal but must jump everywhere, one jump is equal to a turn, one attack is equal to a turn and so on. 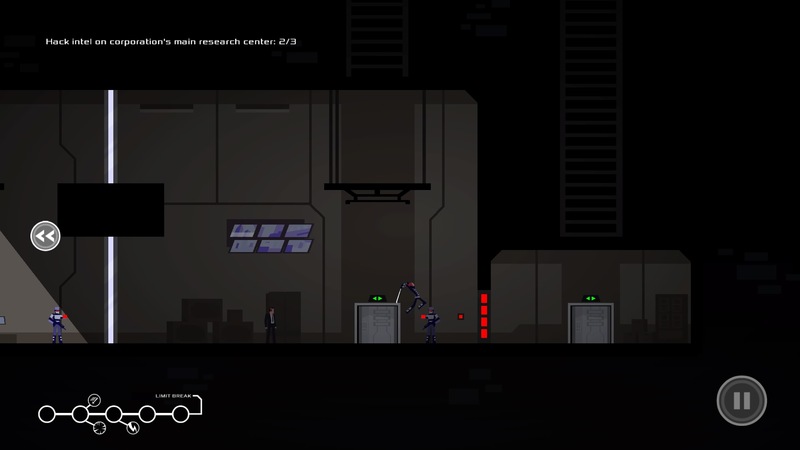 Enemies tend not to move (although enemies with swords do dash in a specific direction as an attack) so you have to make your way around the room, dodging gunfire whilst thinning the enemy’s numbers. Where the enemy will shoot on the next turn is shown with a red line which allows you to plan where you don’t want to be at the end of your move. Different enemies have different behaviours with the basic ones firing one pistol shot and the more advanced versions firing a machine gun that continues for two turns. Depending on the amount of enemies in a room getting that opening can be difficult and that is the key to succeeding in Ronin. Luckily the game is very generous with its checkpoints. If you’ve cleared out a room of enemies then the game will generally save so you don’t have to go through all that again. It’s a good thing too as I found the best way to progress is through trial and error rather than actual skill. You might try to go for the machine gunner first but he’s on the other side of the room so you have to weave through too many shots and you fall (one hit kills you). So maybe this time you use your grappling hook (you can shoot it in any direction whilst in mid air) and swing through the window kicking the first guy into the second and then try making a break for the machine gunner. 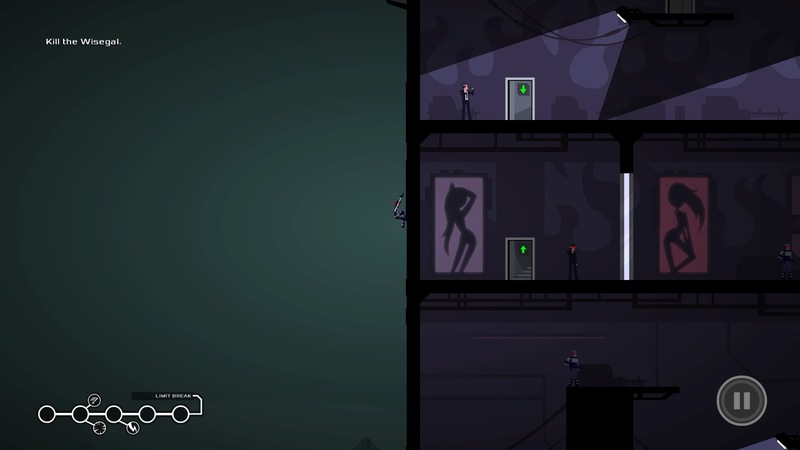 Or perhaps if there are some shadows you can swing through the window and hide out of sight, using the death from above skill you may or may not have unlocked to silently take out enemies, hopefully clearing the room before they report the broken window. It was with the use of stealth and shadow that I enjoyed myself the most in Ronin. Whether it was killing enemies or avoiding civilians I felt I could actually plan my movements ahead of time and have it all play out perfectly, whereas in the open battles you are very much reacting on the fly and sometimes it felt like luck was as much of a factor in succeeding as planning. Obviously as you progress things get more complicated but your goals are the same for all the levels. 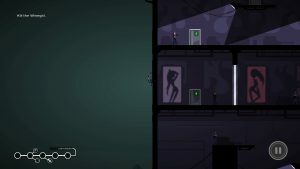 The final level does vary slightly and is actually suitably epic with your actions deciding which ending you get (there’s almost no difference bar the trophy you unlock to be fair) but if you think of Ronin as a puzzle game where you have to figure out each room then you won’t be far off. Upon completion you unlock New Game Plus which lets you play through the levels again with your unlocked skills, different enemy placement and some enemy behaviours are different too. Beyond that I’m not sure there is much replayability here. The fifteen levels won’t take you too long to complete either so whether you’d want to pay £10 for the pleasure is your call. I really enjoyed my brief time with Ronin though. The trial and error aspect of the gameplay was a little disappointing but finally completing a room which has caused you problems or nailing something on your first try is super satisfying. The scope for doing cool stuff is there, from jumping through windows to throwing your sword at someone, though quite often doing the safest thing is the best policy. If you go in expecting a tactical game dressed as an action game you then you’re approaching with the right frame of mind and you should get a side dish of fun with your revenge. 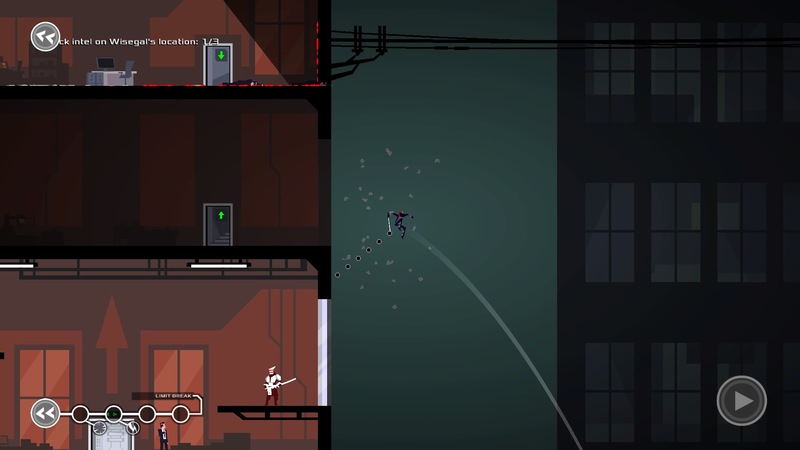 Ronin combines style with tactical gameplay to make an enjoyable quest for revenge. Its reliance on trial and error as opposed to careful planning is a little disappointing but the satisfaction of dispatching an entire room of armed goons makes up for it.